Spanish composer; a pupil of his brother Pedro and (briefly) of Morales. He directed music at Jaén cathedral in 1546-8, and was a singer at Seville cathedral in 1550. In 1554 he succeeded Morales as choirmaster at Malaga cathedral, but he returned to Seville the following year to direct the music there. 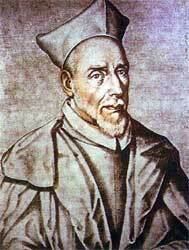 He travelled to Rome in 1581-4 and made a pilgrimage to the Holy Land in 1588-9. Unlike his compatriots, Morales and Victoria , Guerrero was taught and worked entirely in Spain. His style is less intense than theirs, but alongside a gentle lyricism he displays a superb mastery of contrapuntal device, which places him among the great Spanish polyphonists. He published seventeen Masses, two Requiems, four books of motets, volumes of psalms, Magnificats, Vespers music and Passions, and a collection of spiritual madrigals to Spanish texts. The spiritual madrigals reflect a Counter-Reformation fervor; though intended for a secular context, their texts are devotional contrafacta.